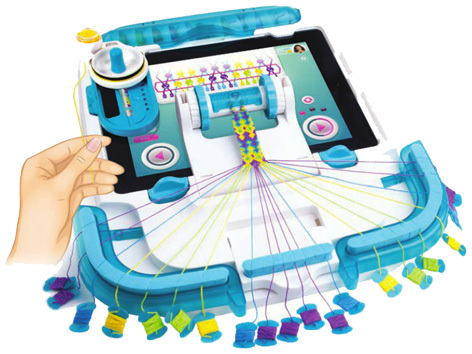 Supplied by Wooky Entertainment Europe, the i-loom transforms your iPad into a jewellery creation station. Clipping over the face of the tablet and working with a downloaded app, young designers can make, create and share their creations. Children ‘watch and copy’ the instructions on the tablet to craft their very own unique pieces of jewellery. Fashionistas can follow step-by-step instructions or choose to make their own and share with an online i-loom community. The starter set contains ten thread bobbins as well as two bracelet reels, patterns and a free app download. A dispenser is located at the top of the i-loom and the threads can be automatically measured to the correct length. The tablet app explains jewellery making techniques through a series of tutorials. Kids can start a design and then save it part way through for finishing off later. They can use the supplied templates or design their own once they have mastered the simple methods. Please tell us what you think of the i-loom by Wooky Entertainment.